"M4 style" fat hand guards for your 20” rifle . Made from heat stabilized glass filled nylon 6 using injection molding and feature a single aluminum heat shield. These hand guards are made to fit 20" rifles and those that use full length hand guards. 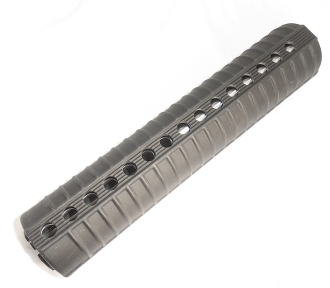 They are designed to work with triangular handguard caps, but can function with round handguard caps.